While rental markets are cooling nationally, market conditions remain extremely tight at the low end of the market, offering little relief to affordability pressures faced by renters with the lowest incomes, according to our new report, America’s Rental Housing 2017. 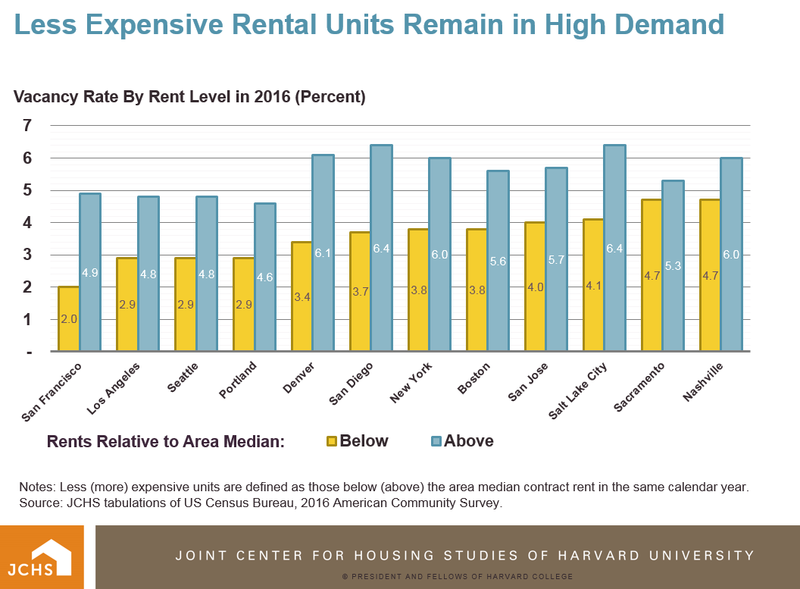 In fact, by several metrics, lower-priced housing is increasingly hard to find not only in high-cost coastal areas but also in many inland areas where rents are generally lower. Illustratively, vacancy rates for less expensive units – those with rents below the median for their metropolitan area – were below those for more expensive units in 42 of the nation’s 50 largest metros, including all but one of the nation’s largest 15 metros. Moreover, in 14 of the 50 largest metros, vacancy rates for less expensive units were less than or equal to 5 percent last year, compared to 2006, when just three metros had such tight conditions. The tightest markets were in San Francisco, Los Angeles, Seattle, and Portland, where vacancy rates for less expensive units were under 3 percent (Figure). Notes: Less (more) expensive units are defined as those below (above) the area median contract rent in the same calendar year. Source: JCHS tabulations of US Census Bureau, 2016 American Community Survey. Such ultra-low vacancy rates are unusual, at least compared to a decade ago. 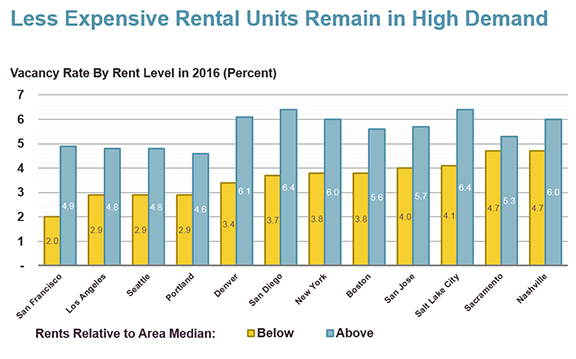 In San Francisco and Denver, for example, vacancy rates for units renting for less than the area median were closer to 8.5 percent in 2006 (a similar period of relative market strength), but by 2016, they had fallen to 2.0 and 3.4 percent, respectively. Similarly, in Seattle and Portland, vacancy rates for less-than-median-rent units were 5.8 and 5.6 percent respectively in 2006. However, in 2016, the vacancy rate for these units had fallen to just 2.9 percent. In fact, the only major metro to see consistently low vacancy rates in the lower-cost segment during both periods was Los Angeles, where the rate declined from 3.4 percent in 2006 to 2.9 percent in 2016. Metro areas with the steepest drops in the vacancy rate for less expensive units from 2006 to 2016 generally had high vacancy rates to begin with. For example, in Cincinnati and Kansas City lower-rent vacancy rates declined from 16.7 and 14.2 percent, respectively, in 2006 to 7.5 and 6.7 percent in 2016. The Nashville and Detroit rental markets were also transformed over this period, with vacancy rates for low-rent units dropping from 10.0 and 10.9 percent, respectively, to 4.7 and 6.1 percent. Data from RealPage, Inc., which classifies professionally managed apartment markets into three segments (according to quality and cost for the area) confirm these trends. Within the 100 markets they track, vacancy rates in the highest-priced Class A segment rose 1.5 percentage points over the past year to 6.0 percent while those in the mid-priced Class B segment rose 1.0 percent to 4.6 percent. In contrast, vacancy rates in the low-cost Class C segment remained relatively unchanged from the past year at 4.1 percent in the third quarter of 2017—their lowest level since the early 2000s. Moreover, in a handful of markets, including Miami, San Jose, Honolulu, San Diego, Sacramento, Minneapolis, Portland, and Orlando, vacancy rates in the Class C segment were below 1.5 percent. The bottom line is that while rental markets are cooling nationally, households in need of modestly-priced rental housing still face challenging conditions in many areas. Many previously low-demand markets heated up over the past decade, while markets for less-expensive units tightened further in metros that were already expensive. With vacancy rates for less expensive units at rock-bottom levels, relief from market cooling is unlikely to be felt soon by low-income families. Full data for all metro areas, including median rents, is available in Table W-19 of the report’s appendix tables.